Earlier today, many Blackberry users reported that WhatsApp stopped working on their phone. 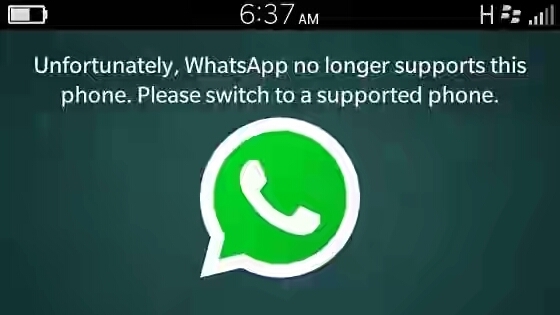 It's more confusing because WhatsApp issued assurance that it won't be ending support for BB phones running Blackberry 10 OS, Nokia S40 and N9kia Symbian S60 devices until June 2017. However, while we are still pondering on this more people continue sending reports that they are unable to use whatsapp while few others said they just saw the message but are still chatting and making use of the app. It has worked for others so apply same tip to continue your chat. Your friends are missing you over there on whatsapp. Your group members need to see your updates. But i will advise you to act fast and migrate to supported devices. Get a new Android or iOS phone to continue enjoying WhatsApp after June 2017. You can check latest smartphones Here, the specs as well as the price. Eehyaa.. Bb users how market?